A couple of weekends ago, Chloe and I travelled to Spain, and spent 3 wonderful days in the Spanish capital of Madrid. Having both spent many childhood holidays on the South coast of Spain, neither of us had ventured this far inland before, so we were excited to experience a new part of the country. 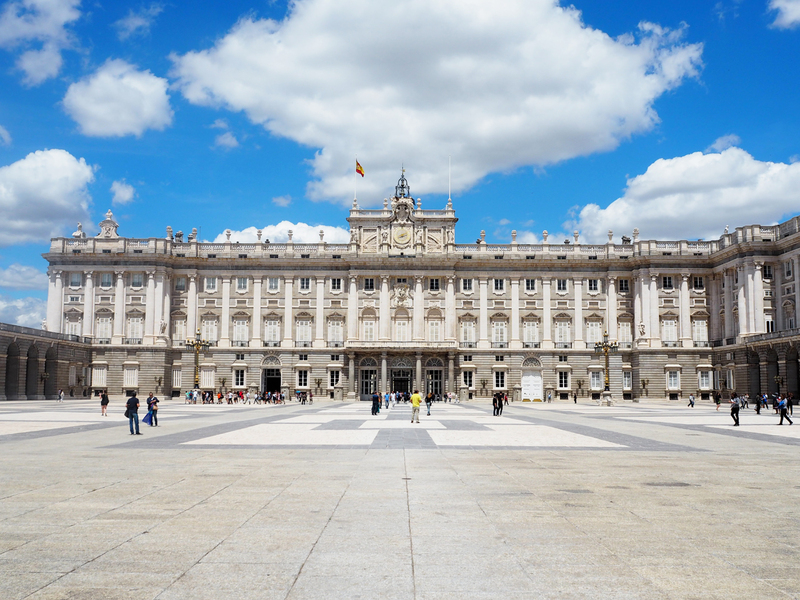 When you think of a Spanish city break, I’m sure Barcelona jumps to mind for many of us, yet Madrid has so much to offer and is perhaps often overlooked. 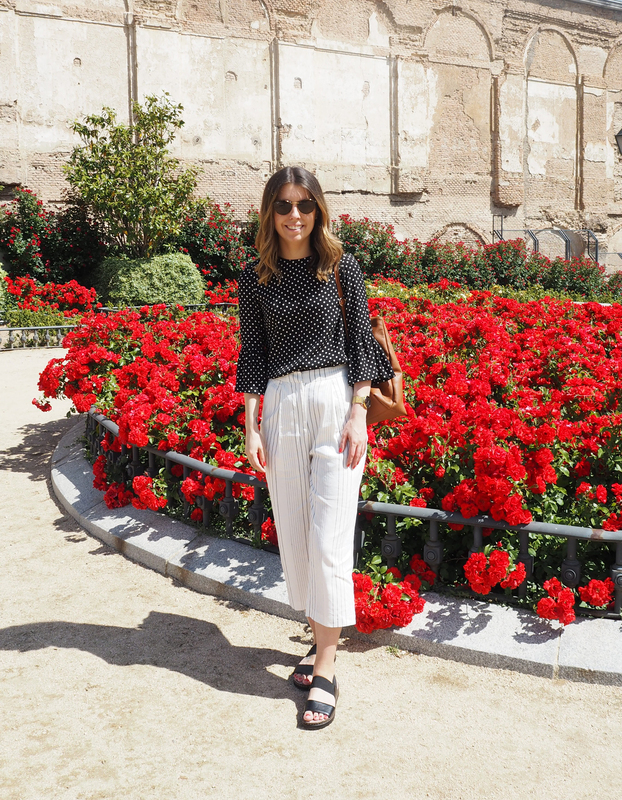 I’ve visited Barcelona many times, and I do love it as a city – it’s vibrant, there’s lots of culture and a beach nearby – but I found that Madrid was equally as fun and had a real buzz about it too. It’s also much cheaper to travel too from the UK and I found food and drink in the capital to also be much cheaper than elsewhere in Spain. Madrid’s airport is well connected with the city. You can catch the metro direct from the airport to the centre of Madrid. We did this, and had to change just the once onto another line to go 3 stops further to our destination. We chose to book an Airbnb, and we couldn’t have been more thrilled. The apartment was exquisite! 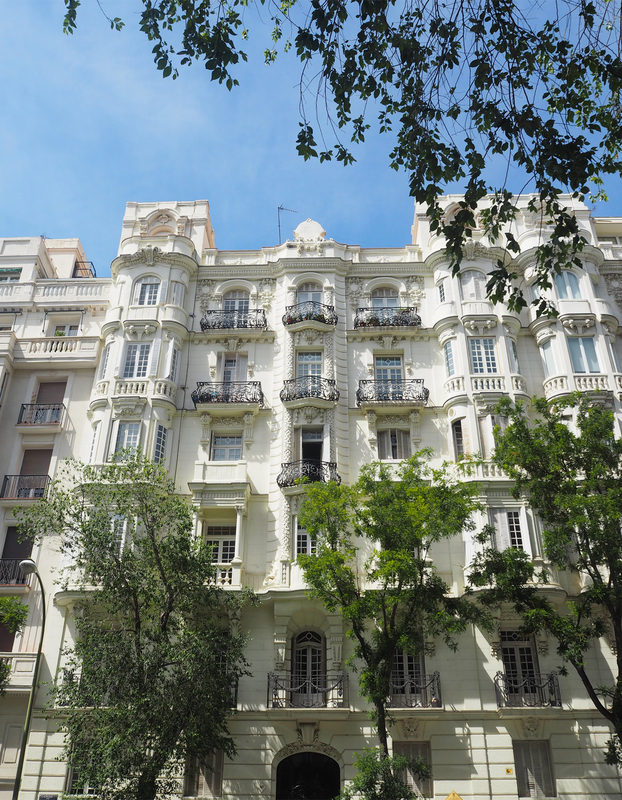 In fact, we found that when booking, many apartments in Madrid were absolutely stunning. They clearly have a keen eye for interiors! Our Airbnb was so good that I’m going to feature it in a separate post. As we didn’t arrive at the Airbnb until around 6.30pm, we quickly got changed and headed straight back out to experience Saturday night life in Madrid. At that time the shops were still open, so the streets were still busy with the last of the shoppers, but also the early birds wishing to go out. We found that we were staying in a very buzzy area of the city, called Justica. Here you will find some of the best high street and boutique stores in Madrid – the shopping is REALLY good here! The likes of Zara, Pull & Bear and Brandy Melville are much cheaper than they are in the UK. We bypassed the shops on our first evening though and headed straight for a tapas restaurant called Lateral that we had been recommended. This is a small chain of tapas restaurants across Madrid, where you will find traditional tapas dishes with a contemporary twist. Having not booked a table, it was lucky that we ate early, as by the time we left around 8.30pm the queue was at least 30 people deep. I forgot that Spanish people prefer to eat much later. After dinner we wandered around to get a feel for our local area, popping into some of the shops that were still open, and then finally making our way back towards our apartment where we stumbled upon a craft beer bar. Much the same as any craft beer pub in England, we were able to sample some local Spanish beers, the perfect ending to a long day of traveling. 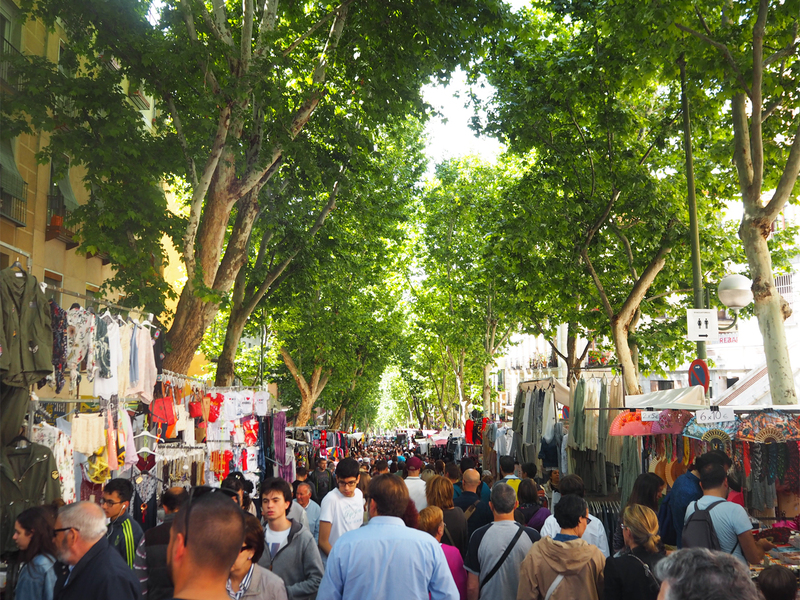 On Sunday morning we woke early as we planned to catch the El Rastro flea market that is only open on a Sunday. I will go into more detail of this huge Spanish market later as it’s one of my top 5 things to do in Madrid. But this marked the start of our holiday, exploring the beautiful narrow and windy streets of Madrid. The capital is small enough to explore most places on foot, and although it was hot (pushing 30 degrees), the buildings create a lot of shade and keep the streets relatively cool. I wouldn’t say that there was huge amounts to do and see in Madrid, so 2-3 days is a perfect amount of time to spend here. However, there are many parks in Madrid that are absolutely beautiful, and as the city is no where near a beach, if the weather is nice when you stay here it may be good to spend a whole day relaxing and soaking up the sun, if you like that kind of thing. We wished we’d had slightly more time to do this as on our final day it was beautifully sunny and Parque de El Retiro was the perfect spot to take a picnic and while away a few hours, but alas we had more sightseeing to do! 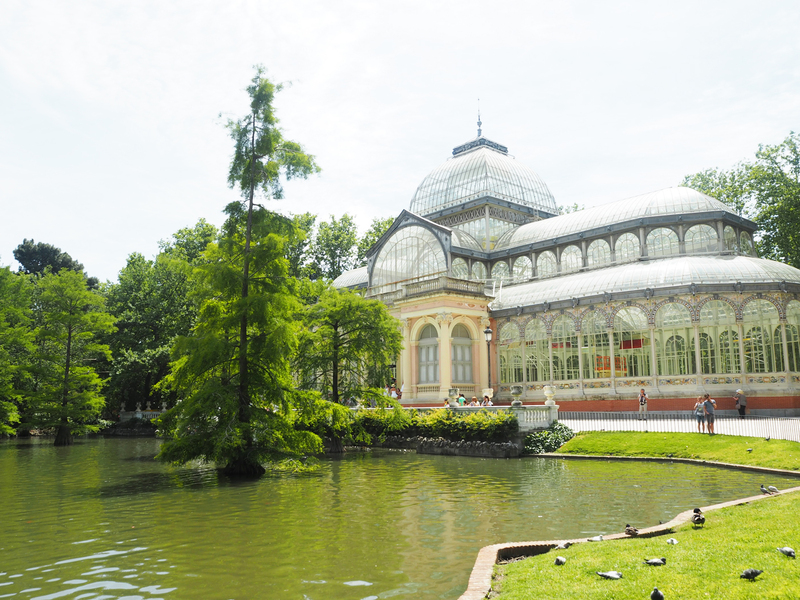 As I mentioned Parque de El Retiro is one of the main parks in Madrid and is rather stunning. With plenty of open green spaces and shaded tree areas, it’s a lovely place to come with a picnic, or grab an ice-cream and sit back and people watch. It attracts both tourists and locals, who flock here for the many street entertainers, paddle boats on the lake and the breathtaking Crystal Palace (pictured above). This incredible glass structure is positioned in the middle of the park and is the perfect spot to grab a photo. The lake surrounding it is home to many fish and turtles, the latter of which come upon to the grassy banks to catch the sun’s rays. We caught glimpses of baby turtles who were just the cutest! 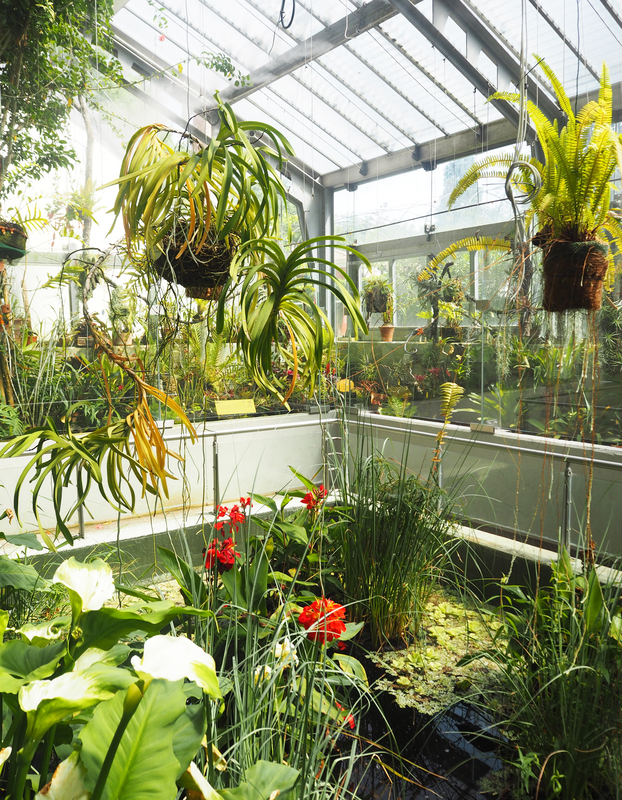 Located in the South East corner of the park, just a short walk away, is Royal Botanical Gardens of Madrid. These are relatively small in size compared to many others I’ve visited, but they’re still worth a look if you have time. For just €4 you can certainly spend an hour or so here learning about the many different species of plant that grow in Spain. 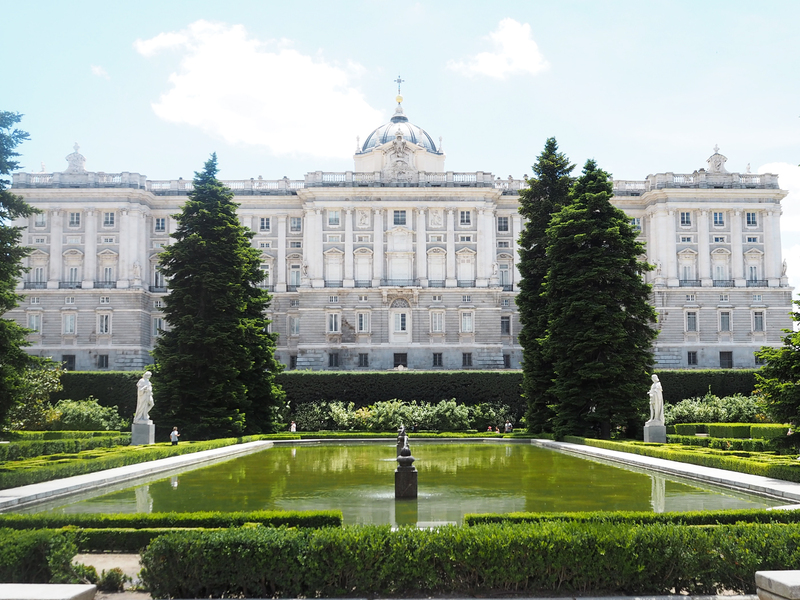 Another impressive garden in Madrid is the Sabatini Gardens, located at the foot of the Royal Palace. The Palace itself costs €10 to enter, which we didn’t do, but you can visit the gardens for free. If you walk past the entrance to the palace, just a little further down on the righthand side is the entrance to the gardens. 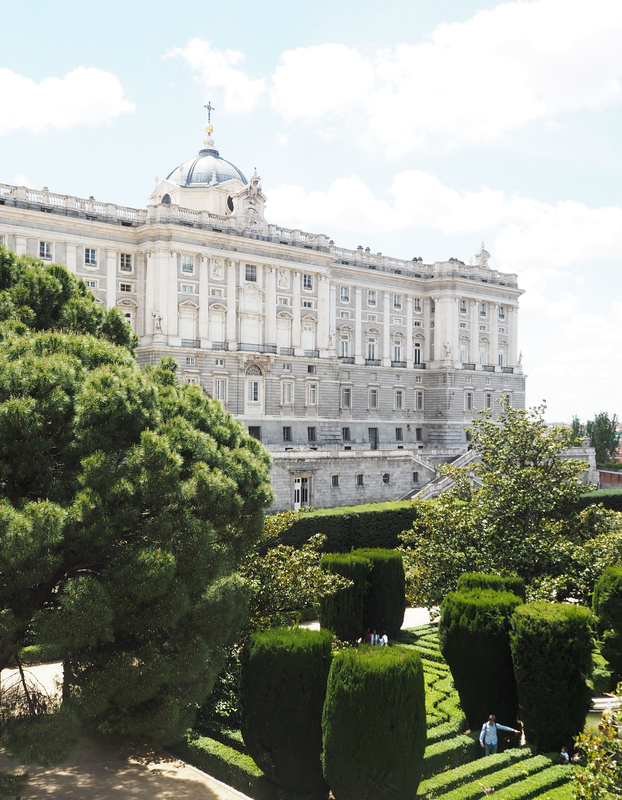 From here you can get the best views of the palace and the gardens are manicured to an impressively high standard. Dotted throughout the park are small fountains and stone benches, a great spot to take a break from exploring the city. 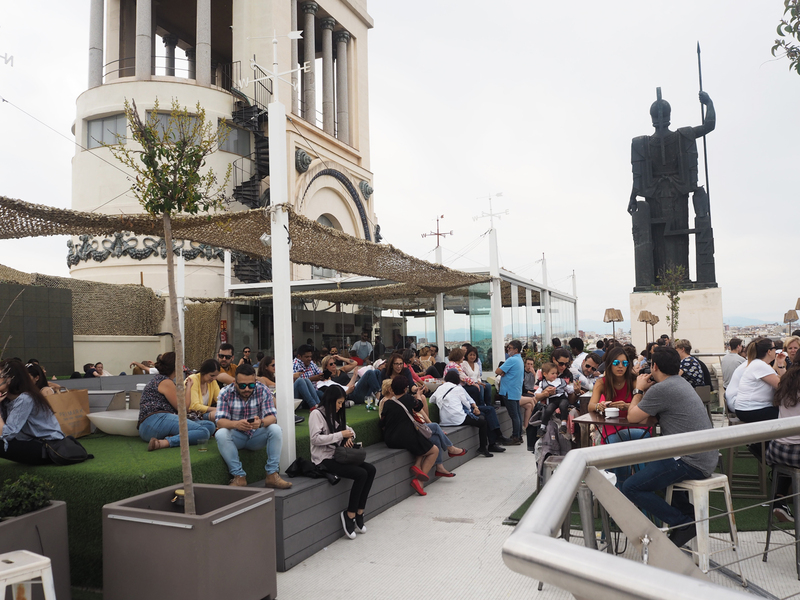 Everyone I know who has visited Madrid recommends drinks on the rooftop of Circulo de Bellas Artes, and I am going to do the same. 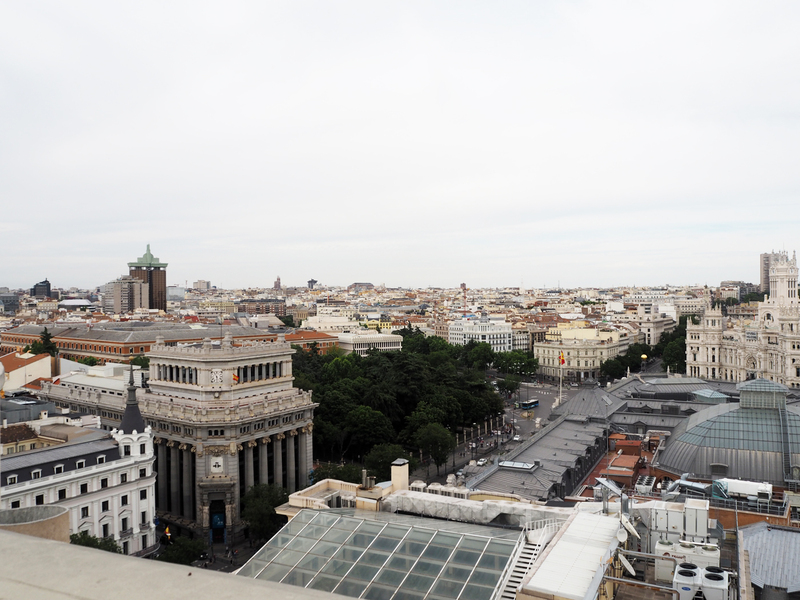 From the top of this gallery/art space, you can get some of the best views of Madrid. The bar is busy no matter what time of day you arrive and has a really cool atmosphere about it. There are plenty of seats, and even some beds for you to lie back and take it all in. There are a number of different bars all serving beers, wines, spirits and cocktails. 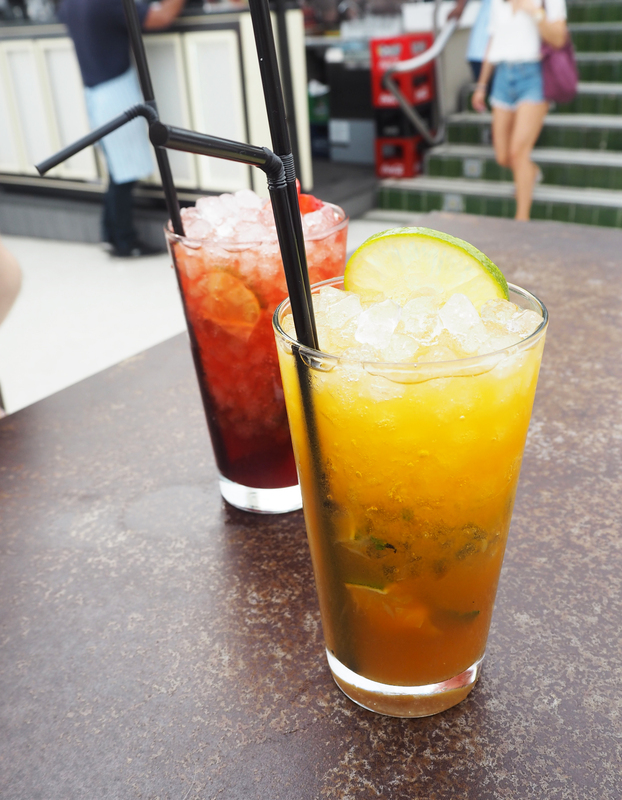 We chose the house mojito that comes in a variety of flavours. One thing I will point out is that you have to pay €4 for a ticket just to get up to the roof, and this doesn’t include anything else in the building, so is like an entry fee I suppose. This was communicated to us before, and although it isn’t a lot of money, can take you by surprise at the entrance. The cocktails are also a lot more pricey than elsewhere in Madrid but you’re paying for the beautiful view and gorgeous surroundings. Plaza Mayor is the largest plaza in Madrid and is home to many bars and restaurants dotted around the outside of the square, with plenty of tables and umbrellas outside each, allowing you to dine alfresco. When we happened to be here, there was a Spanish festival taking place, and so we grabbed a local beer and sat back and enjoyed the likes of flamenco dancing and mini castells (human towers). I imagine food here is a lot more expensive because of the location, but certainly grab a drink and spend an hour taking it all in. It’s a really lovely spot. 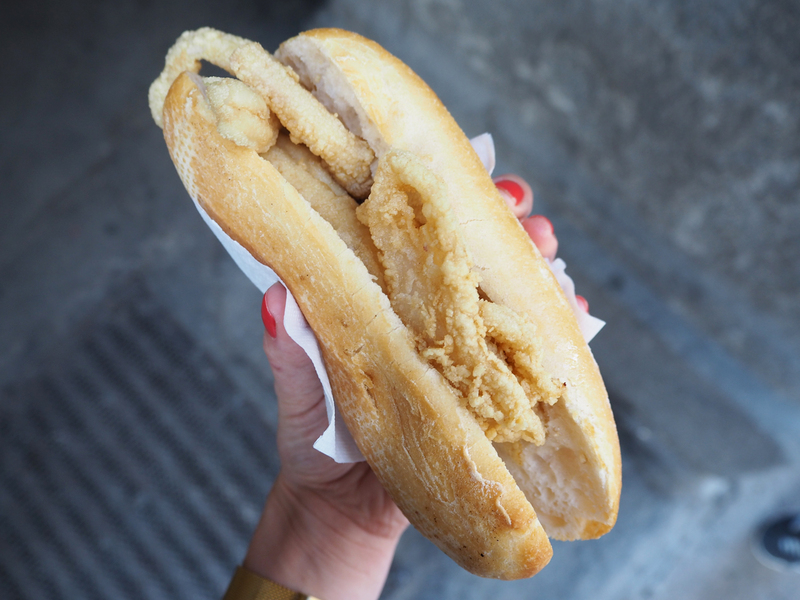 Also dotted around the plaza are many street food vendors serving up calamari sandwiches, a tradition here in Madrid. For just €1.80 we had a baguette filled with calamari, although I have to say it wasn’t for me. There was no butter and no sauce, so it was just fried calamari in a dried bread roll – very strange! 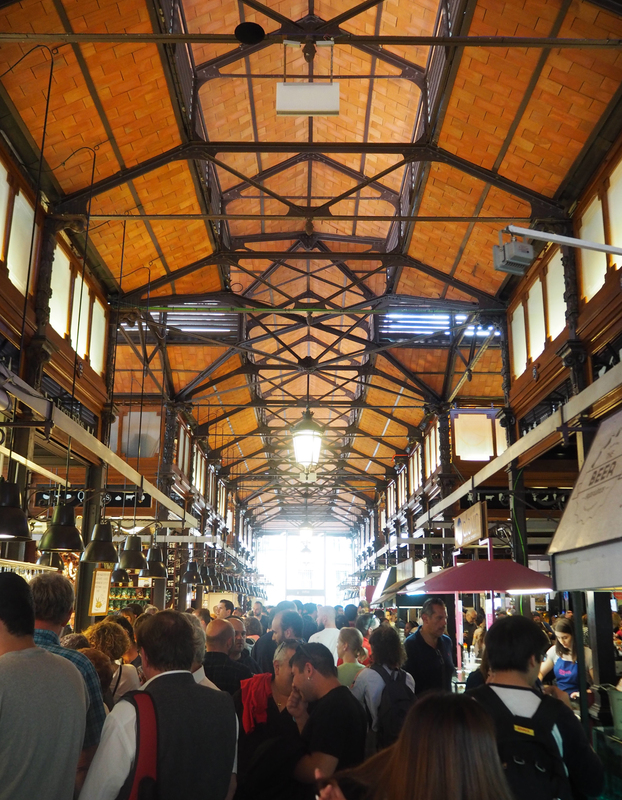 Nearby however, is the Mercado de San Miguel, a beautiful indoor food and drink market. This upperclass market is more expensive than any other we saw in Madrid, but the selection of food and drink available is quite exquisite. It’s great to see all of the local produce made into beautiful, eye-catching dishes. You can grab a drink and wander round taking it all in, even if you don’t want to eat anything. 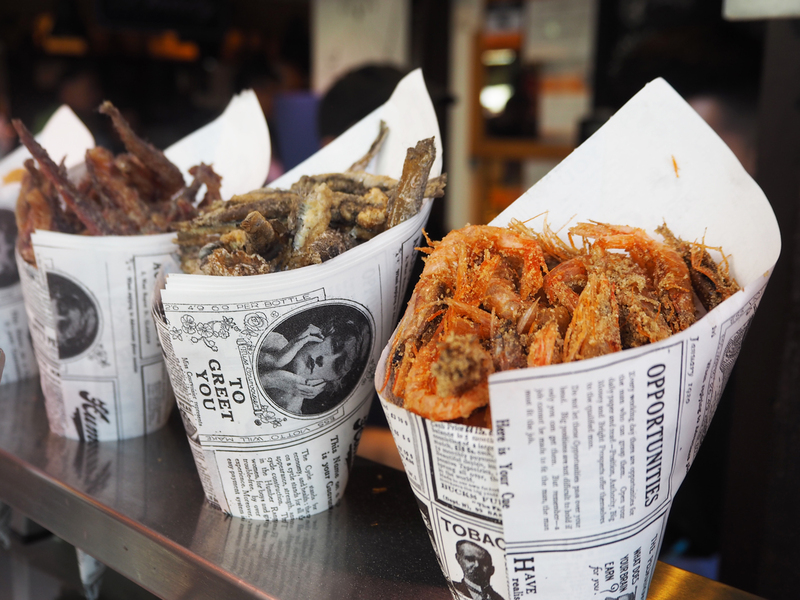 Also near to the Plaza, just a few streets away, is Madrid’s most famous churros – San Gines. 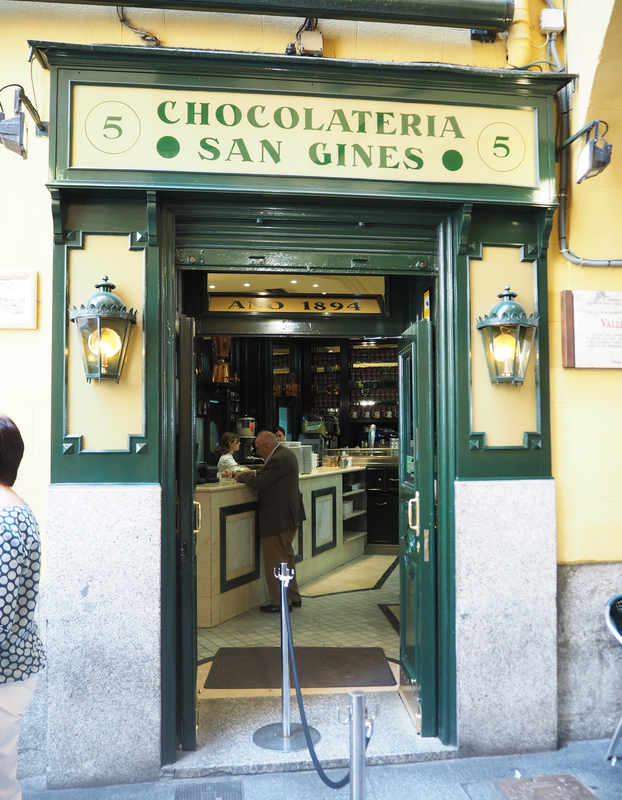 San Gines is a chocolatier who has been in business for over a century!! I believe the original property has expanded quite a bit as it now has 3 or 4 separate restaurants and takeaway dotted in a line, serving up their world famous churros. Although San Gines is open 24 hours (yes you heard right), it can still get extremely busy with queues outside. We were lucky and managed to get seated straight away. I’m not the biggest fan of churros, but they were pretty tasty and so cheap. 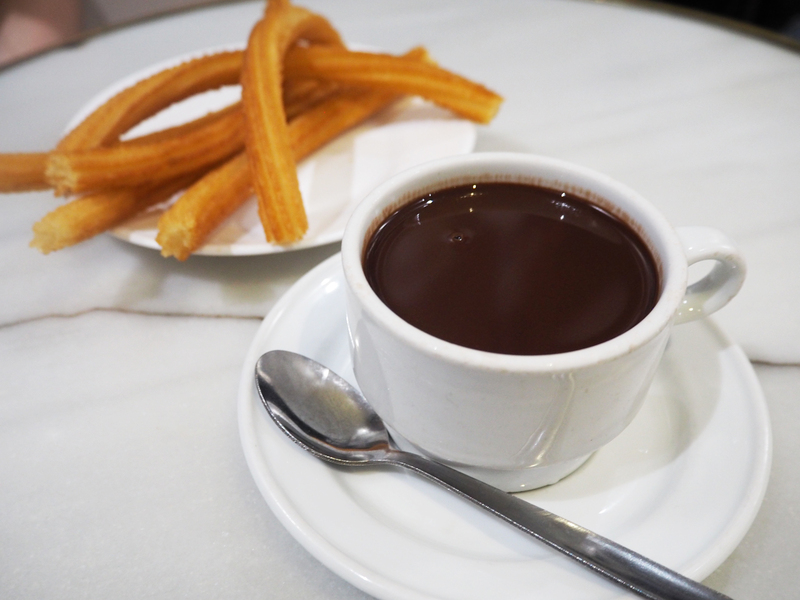 I think we paid €4 for half a dozen churros and a mug full of chocolate. For me the chocolate was more impressive than the churros, but I’m glad we shared, as it’s very rich! 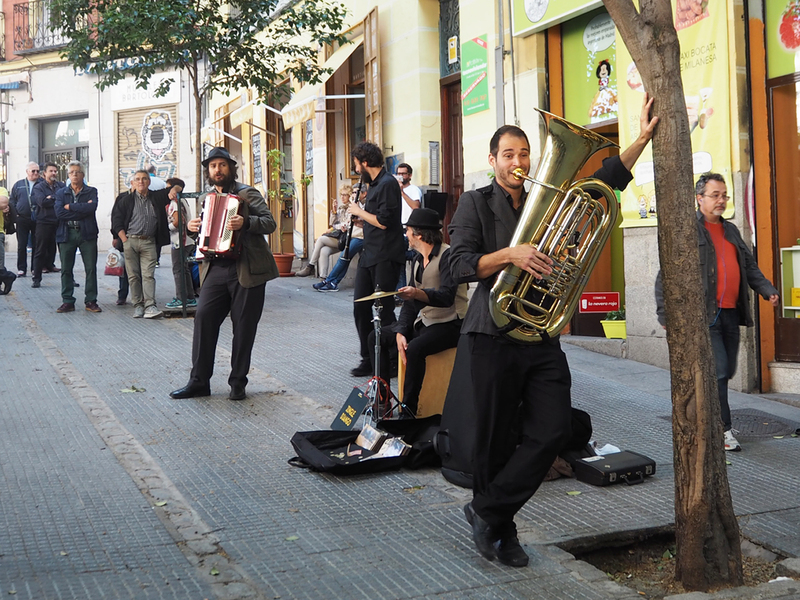 And finally, as I mentioned towards the beginning of this post, every Sunday in Madrid there is a giant flea market that takes place, called El Rastro. This market sells just about everything you could imagine – clothes, food, drink, souvenirs, accessories, jewellery, leather items – and it spans countless numbers of streets. 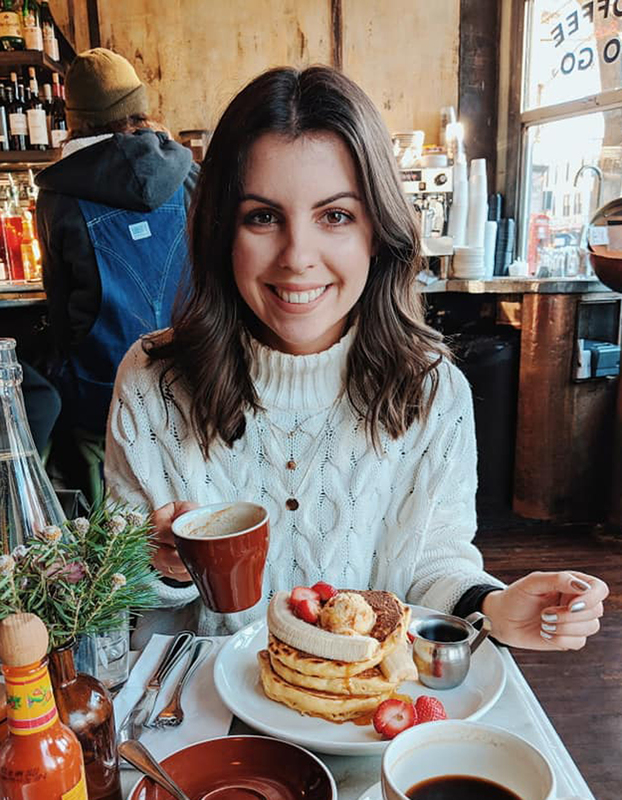 You could easily spend an entire morning strolling around, checking out the Spanish offerings, and bantering for the best price. There’s also a wealth of entertainment on the streets, including this fun brass band I managed to photograph, who’s tuba player posed on cue! 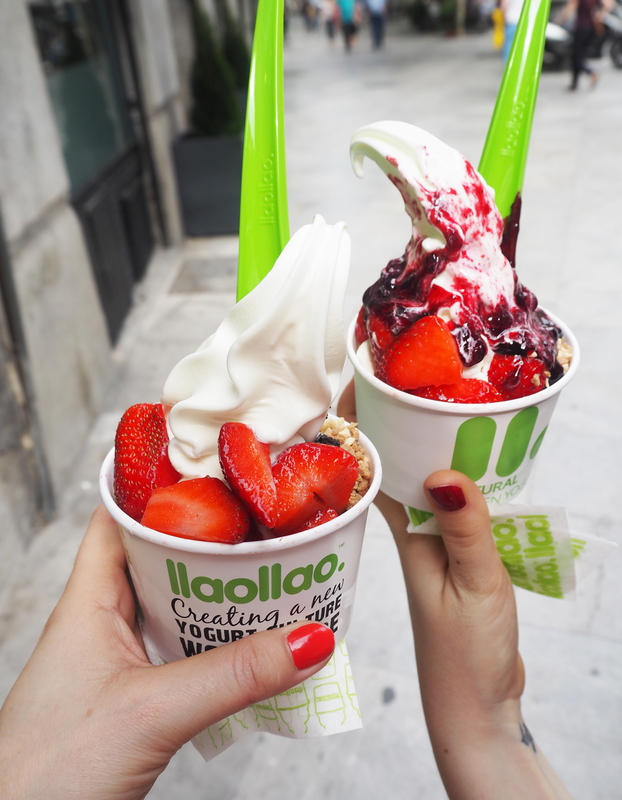 I also must mention Llaollao, the frozen yogurt featured at the very top of this post. These are dotted all over the city and serve up some of the best frozen yogurt I’ve ever tasted. For 3 toppings, we paid just £2.80, and you can pick which toppings you’d prefer from a whole bar of them. Considering the amount of yogurt and toppings they pile on, it was an absolute bargain and the perfect way to cool down!